You filled your beloved’s Easter basket with waxy confect from the nearby mega-mart. Some mass-produced mess in a golden box, perhaps? How original. Not that I can blame you – that’s how you were raised. But it’s a wonder you haven’t been walked out on. Fear not, artless lover, there is time to make amends. 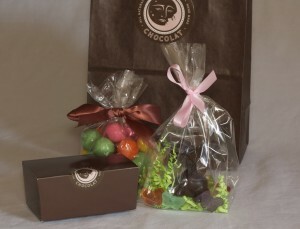 Meet Lune Chocolat. 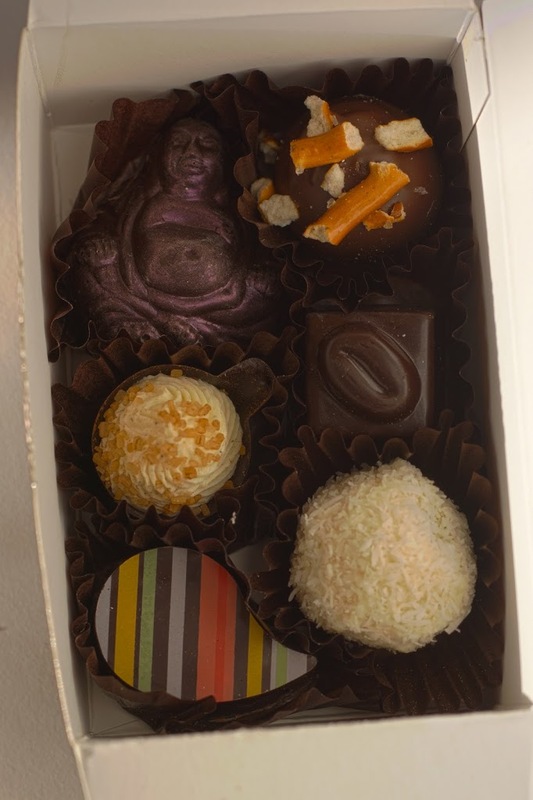 Their tagline urges you to “Fill Your Soul With Chocolate” and, my word, you only have to gaze upon their wares to feel so inclined. Imagine a treat cart on Hogwarts Express filled with confectionary rapture for grown-ups. We’re talking jouir, people, a stratum of flavors that demand to be savored. You’ll find no brittle molded bunnies here, no rubber laboratory chocolate injected with pop tart filling. 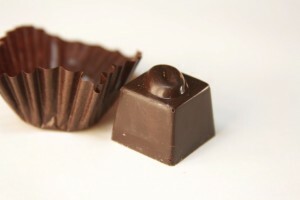 These sophisticated gems are infused by hand with the likes of fresh rosemary, divine Absinthe, habanero and, for goodness sakes, sweet potato ganache. I visited the shop yesterday; once inside it was all I could do not to throw myself against the glass in wonderment and proclaim, “I’ll take the lot!” Restraint. Deep breath. I chose 6 pieces. 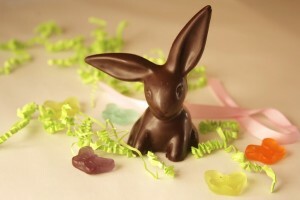 Plus a floppy eared solid chocolate bunny. 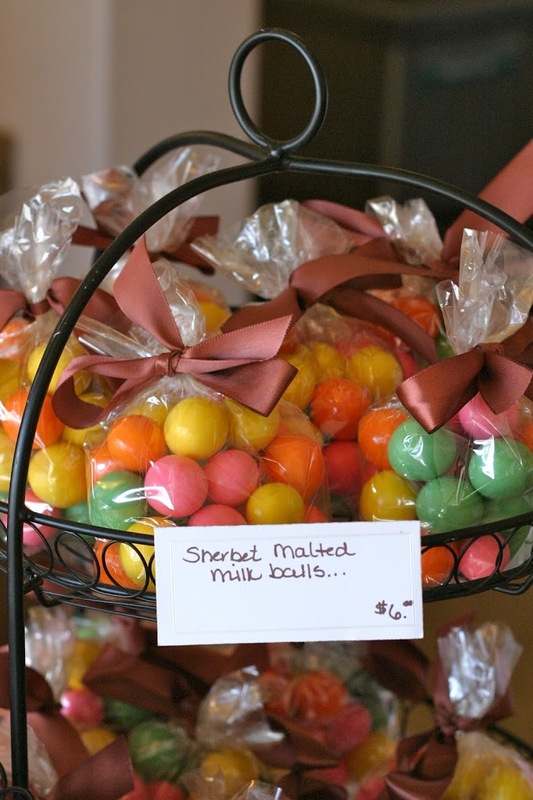 And a last-second bag of malted milk balls just before the credit card was run. 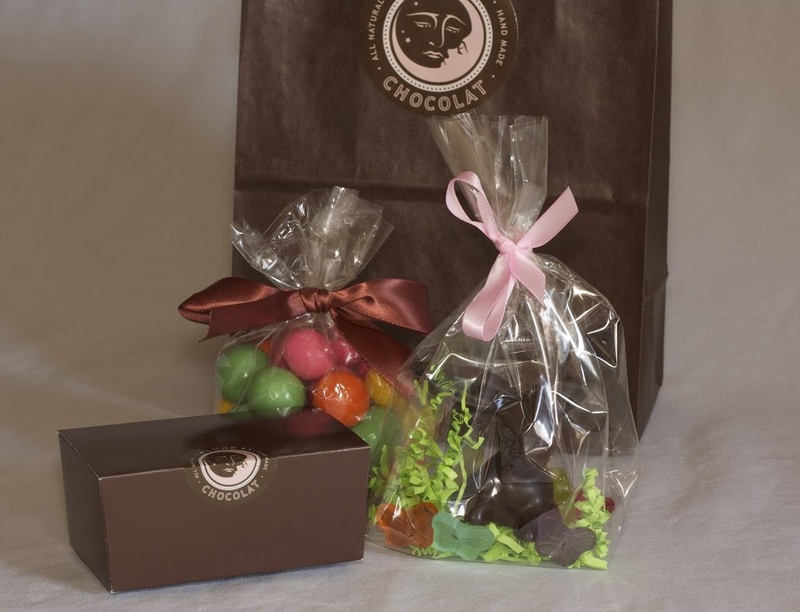 I can only assume the reason you, too, have not succumbed to the delights of Lune Chocolat is because you’re cheap and utterly lacking a spirit of adventure concerned that exquisite confections may be outside your budget. We’re friends, you and me, so I’ll give it to you straight: my entire tab came to $24.30. Flavor & Impressions: Oh my. Somebody get me another one now. One of my favorite things about shopping locally are the backstories (have you ever had a cashier at Wal-Mart look over your selections and exclaim, ‘Hey, let me tell you how we got the idea to make some of this stuff!’ I think not.). According to Emily, Lune Chocolat’s co-owner, the business came into possession of a mug-shaped mold that initially nobody knew what to do with. 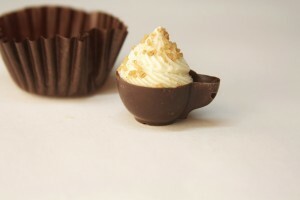 It was the brainchild of a brilliant young intern to fill each chocolate cup with melt-in-your-mouth vanilla latte ganache. Viola! Just like that my favorite tasty confection came into being. Get one. Better yet, get me one. Flavor & Impressions: This guy is so cute at first I felt guilty about taking a bite. Then I remembered guilt just clogs up my chakra so I relished the little fella with gusto. 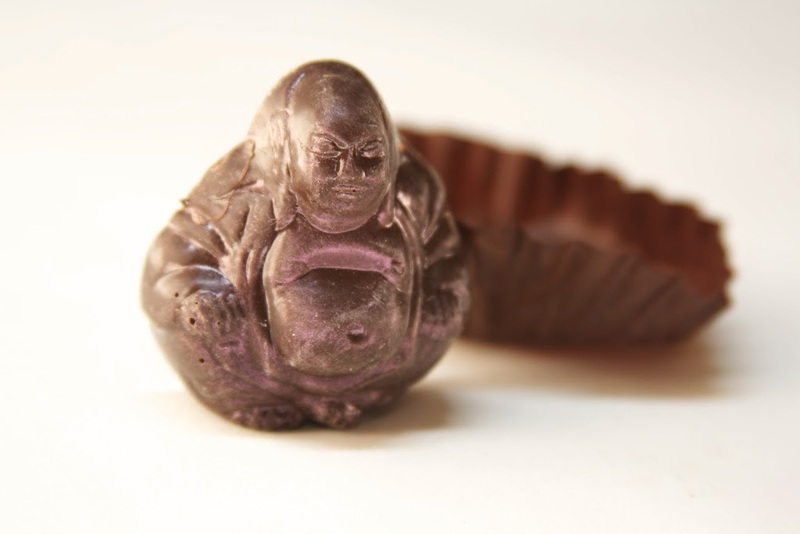 He’s a dark chocolate exterior with smooth, unmistakably spicy chai ganache inside, a.k.a. a fat and sassy saint of deliciousness. 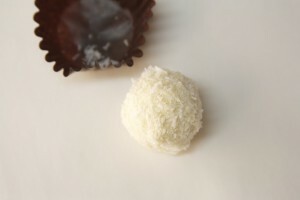 Flavor & Impressions: Turning on its ear the notion that delectable confections are only for ladies and fussy French men, meet a salty-sweet treat with a hint of the Irish staple. 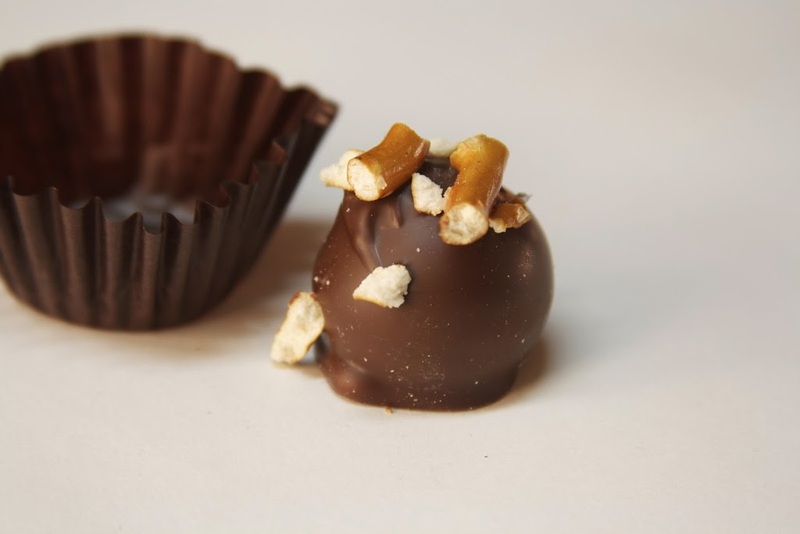 The truffle is filled with Guinness ganache and topped with locally produced Terrell Pretzels. Makes me think ‘Super Bowl!’ Fun. Yum. Flavor & Impressions: This was the first treat we pulled out of our little box. 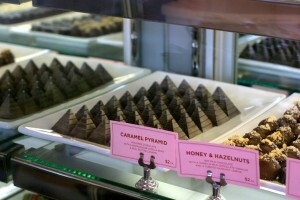 We bit into it and looked at each other with a ‘wow!’ – and it isn’t even made of chocolate! This coconut truffle has a sweet, buttery interior surrounded in slightly bitter shavings. Flavor & Impressions: I judged this book entirely by its cover and I was so right for doing it. 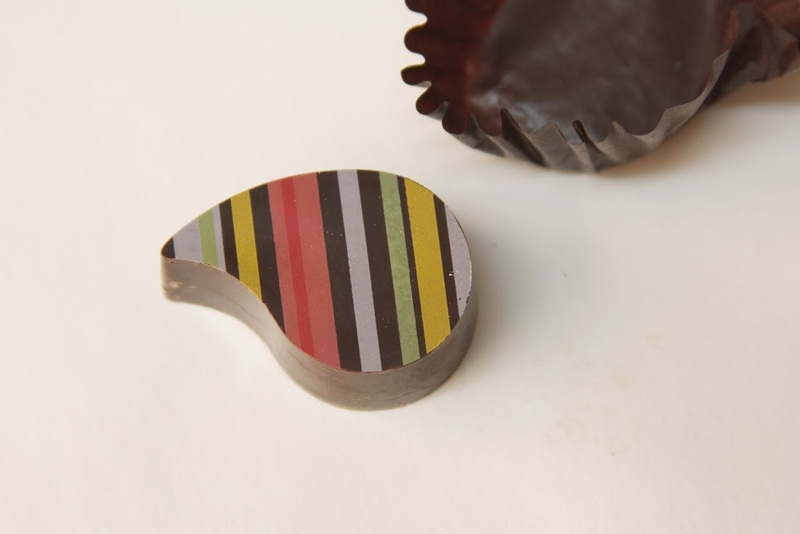 Colorful stripes outside, bright, fresh raspberry reduction ganache within, this lovely little gem pops with flavor. 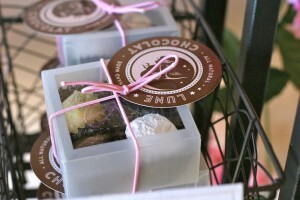 Backstory: when the season permits, Lune Chocolat uses local, organically grown raspberries. Incidentally, for the Earth conscious among us (hoping that’s pretty much everyone) Lune Chotolat uses biodegradable and 100% compostable packaging. So hurry now, my dears, and make amends for the thing of shame you bestowed upon your Other this morning. Chocolate is for lovers, and once your darling discovers you’ve gifted soul-soothing Lune Chocolat, they will know they are adored.